Is The El Nino Dead? 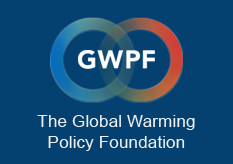 Data indicates that the expected El Nino Pacific Ocean warming event may be waning and that if it occurs at all then it will be extremely weak. Australia’s Bureau of Meteorology (BoM) says, in its latest update published today (7 October 2014), that tropical Pacific Ocean indicators “remain within the neutral range, having failed to maintain sustained values typical of El Nino”. The US National Oceanic and Atmospheric Administration (NOAA) said in its weekly update published yesterday (6 October 2014) that equatorial Pacific upper-ocean heat anomalies are near zero and that this together with the temperature gradient in the ocean “reflect ENSO-neutral conditions”. Both agencies suggest the chances of an El Nino taking place are above average. BoM states that computer models indicate a 50 per cent chance of an El Nino in coming months – this is twice the usual probability. NOAA continues to predict that the chance of an El Nino is at 60-65 per cent during the Northern Hemisphere fall and winter – although this may change with its next monthly discussion (known as the ENSO Diagnostics Discussion) due out soon. The evidence suggests that the Pacific Ocean is drifting away from El Nino conditions. BoM says that sea surface temperature (SST) anomalies (the variation to the long term average) have cooled in the central tropical Pacific over the past two weeks with some warming in the eastern tropical Pacific although positive anomalies are present along most of the equatorial Pacific. The equatorial Pacific has cooled in the east and warmed in the central region when compared to the preceding month. Sub-surface temperatures across most of the equatorial Pacific are near average, although slightly warmer than average in the eastern equatorial Pacific. 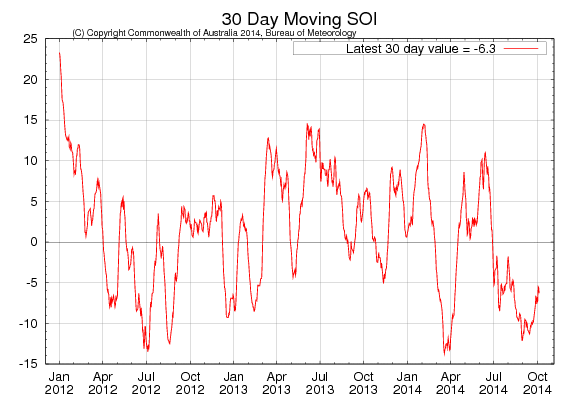 The southern oscillation index (SOI) – a key measure used by El Nino watchers – which compares the air pressure difference between Tahiti and Darwin in Australia has also moved away from the El Nino threshold. The 30-day SOI value to 5 October is −6.3. Sustained negative values below −8 may indicate an El Niño event. Values of between about +8 and −8 generally indicate neutral conditions.